← Featured in Bloomberg Businessweek! Inspiration really can come from anywhere. Sometimes I will see an odd product at a hardware store and just know, that could be a light. Sometimes I see a fully formed light idea and just know I have to try it for myself. That’s what happened with this project. I may not have been posting over the last three months, but I certainly have been creating. My latest obsession has been with fortune tellers, you know those little folded things we made as kids? (Some people call them ‘cooty catchers’ but I’m not crazy about that phrase, and since I personally only used them as fortune tellers, that’s what I call them.) My best friend spotted these lights at Anthropologie and she just knew we had to try and re-create them. They had basically covered a standard paper lantern (only my favorite material) with hundreds of folded fortune tellers! Well, the first time I had a spare moment I sat down and just knew I had to try this. Folding fortune tellers is really simple, here are some instructions. Then all you have to do is glue them to a lantern! When I first started, I tried to glue all four of the corner pieces down to the lantern, but I quickly discovered that this was really time consuming, and kind of difficult. Because the sphere is, well, spherical, it is hard to get the four corners to all glue down to the sphere at once. And what I actually found was that it was pretty much unnecessary. All you needed was a good dab of hot glue on the center point of the underside of the fortune teller, and then the four corners would just basically fit together on their own. There might be a few gaps, but that doesn’t really matter, and there are probably going to be more noticeable gaps if you try and get the corners to fit to the sphere. For paper I used simple white printer paper, but I am kind of interested in trying one out of newspaper or some similar printed paper. I think it could be interesting to see how the printed layers overlap and blend into one another when you turn the light on. This would also be pretty stunning in a colored paper, maybe bright red or a lovely soft blue/gray. I guess you’d really have to test how the different colors of paper looked, especially when folded over into a few layers. I love this big light, its approximately 18 inches across (I used a 16 inch lantern) and it really makes a fantastic statement piece. It would be cool to do an even larger, maybe 24 or 30 inch light, but since I could never figure out how to ship it, and therefore probably couldn’t sell it on Etsy, and my house is already overflowing with lights, it will probably be a bit of time before I try making one that large. But, if any of you out there attempt your own, I’d love to see the results!! More fortune teller obsession to come, but I figured I’d ease back into these posts and not cram too many projects into too few posts. **UPDATE: This light has been getting a lot of press recently, and its always fun to see people’s opinions or how they introduce the project. One thing I realized I didn’t explain carefully enough is my source of inspiration, which was Anthropologie. They were using these lights as part of their AMAZING store decorations, but they were not for sale as far as I could tell. I am certainly the type of person who sees something and instead of buying it wants to make their own, but I would never want to specifically copy someone’s product and simply sell my own. I probably would have made my own version no matter what, but I just wanted to clarify, since I am certainly sensitive to copying versus inspiration in the craft world and that’s why I always want to let you all know if I have found inspiration from someone or followed an existing tutorial for one of my projects. And of course whereas this light is more of a direct copy perhaps, check out my latest post for a project that takes this inspiration one step further for a somewhat different look that is really all my own. This entry was posted in Uncategorized and tagged DIY, Etsy, lighting, paper, pendant light, repurposed. Bookmark the permalink. Beautiful! This is by far my favorite so far. Well, that spiky vellum one still holds dear to my heart, but this one is just so clever. Great work, and Congrats on all your publicity! I love this idea! How many fortune tellers did you have to make for it? I’m considering doing one with pages from a book! Well, that’s a good question. I did count at one point, but I have completely forgotten. I think if I remember correctly it was approximately 200 fortune tellers, but that will completely depend on the size of lantern you start with, and how big your quare piece of paper is that you are using to fold your fortune tellers. You would need fewer fortune tellers if they are each larger, versus more fortune tellers if they are each smaller. I usually fold a bunch, and then glue them on to get a sense of how many more I might need. Good luck! If you do one with book pages you should definitely show everyone how it comes out! That sounds awesome. Did you use reguar A4 print paper and make a square out of it? I was thinking of using yellow post it’s size paper. I used regular printer paper (we don’t have A4 here in America, but the size doesn’t really matter.) I then cut it down into squares, I think for this size light I used 3.5 inch squares, but you can use any size you want. I chose the largest size that would let me cut 4 squares out of each sheet. For other lamps I’ve used a smaller size, the largest pieces I could get and still cut 6 squares out of each sheet. But, its completely up to you. You can buy them in Chinatown, at Ikea or some lighting stores, plus online. Google Asian Paper Lantern and different online shop options will definitely come up. How did you decide to place your first fortune tellers so that they all lined up nicely in the end? I just eye-balled a midpoint and tried to start there. It’s not exact, but usually close enough. Me encantaria q pusieran los pasos y todo en espanol seria genial ya q solo m baso x lo poco q entiendo y las imagenes se que seria un exito tambien en espanol porfavor!!!! This is so brilliant and exact on time. We have Diwali festival (festival of lights) here in India on Oct 26 and I’m sure going to make one. However I’m having difficulty when accessing the link (gif link); it’s not opening. I’m not sure if there’s any problem with my browser. Are you talking about the link to the fortune teller folding instructions? If you google “folded fortune teller instructions” you should find lots of results. If you can’t find any let me know and I’ll try to post them as an image in my blog post. Yep, I figured that later and already have started making them. This is such an awesome lamp! I’m thinking about making my own for the stairwell of the house we’re moving into next month. 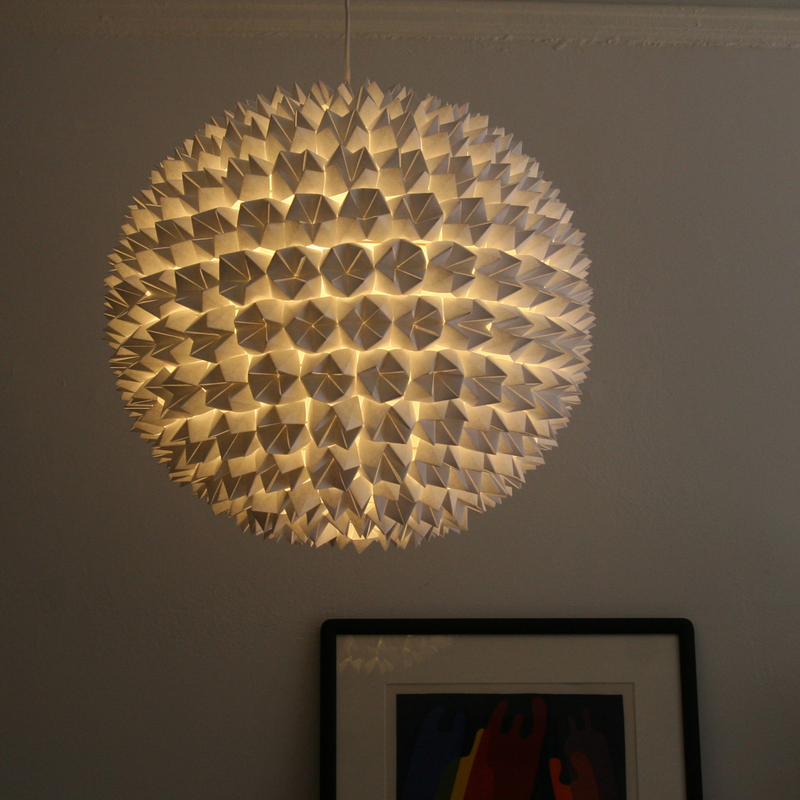 A couple of questions though – can this kind of lamp be used as a “real” light source, or does it work more like a decorative, subdued light, because of all the extra paper attached to it? Do you think it would be advisable to put a strong bulb into the lamp (again asking because of the added paper … I’m such a wuss ^^)? Well, the paper is bright white so there is a actually a lot of light transmitted through, even though there are a few layers. But what you need to be careful of when it comes to the bulb is the recommended wattage for the size lantern you start with. I used a 16 inch lantern, and the largest bulb recommended is a 60 watt, so if you wanted more light you might want to start with a larger lantern. I wouldn’t worry about the added paper, as long as you leave the openings at the top and the bottom of the lantern uncovered because then the air can continue to flow around the bulb and the heat shouldn’t build up. 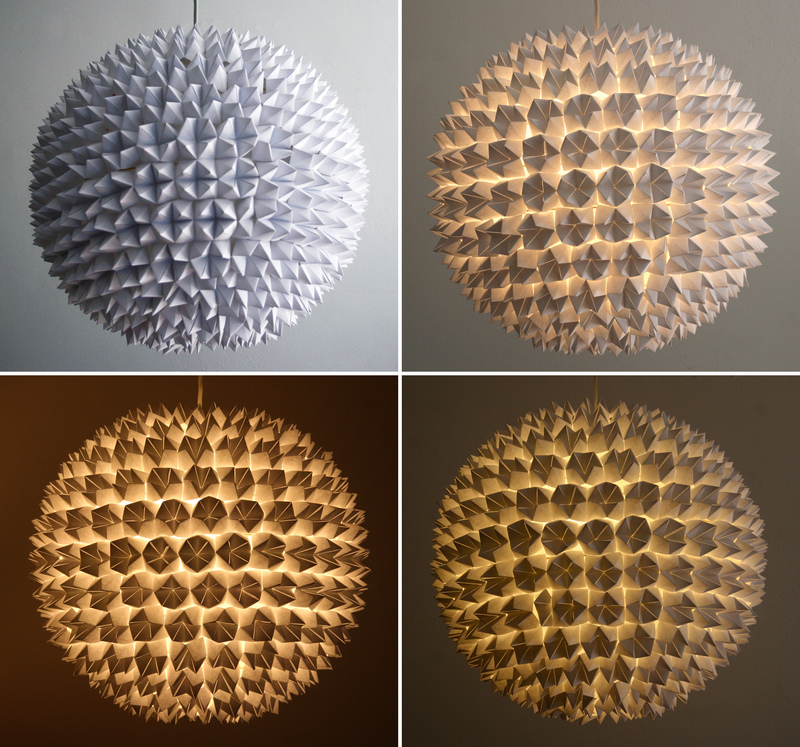 Pingback: Pendant Lamp Made From Hundreds of Folded Fortune Tellers :: Design News : Asia Interiors Catalogue :: Articles and Photo Catalogue New ideas for home interior design. 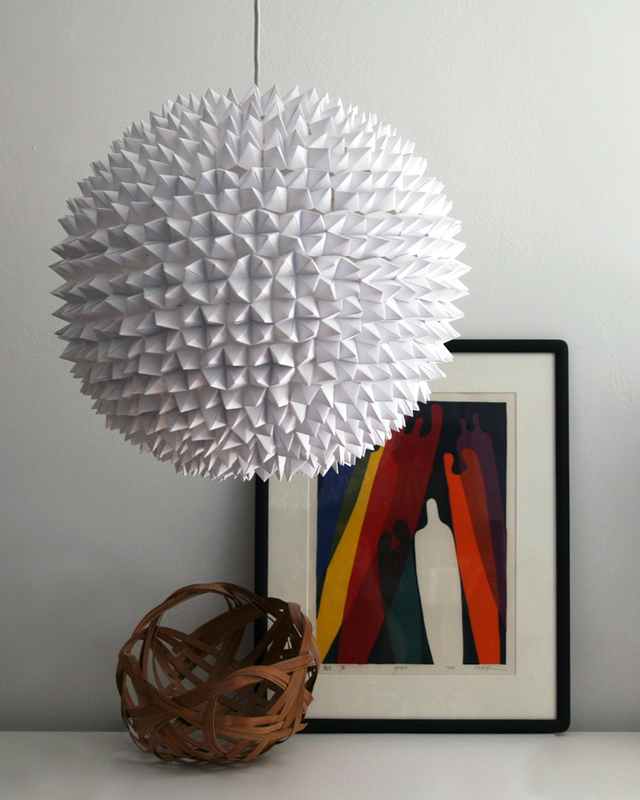 Pingback: Pendant Lamp Made From Hundreds of Folded Fortune Tellers | DesignHomeOnline.net Designs Blog - Catalogue :: More than 16000 Photos, articles. New ideas for home design. I love this!!! !Beautiful ….. Please tell me what kind of lantern you used? 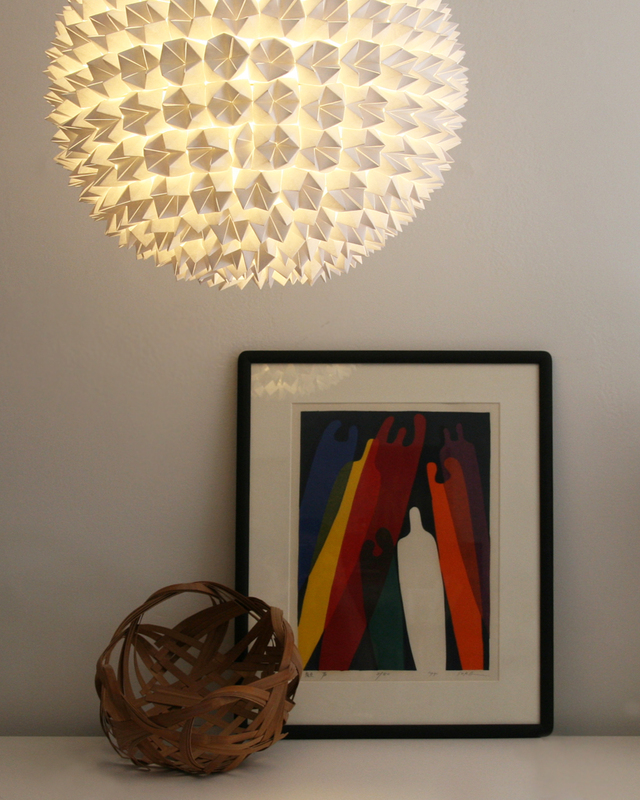 A paper lantern?Where do you buy one? I used just a simple asian paper lantern, I buy them in Chinatown but you can also find them at Ikea and probably Target and other big stores like that, as well as online. Just search paper lantern and you should find lots of options! Such a FABULOUS project! You are so creative. Love the end result! This is simply amazing! Just stunning! Hello Alison, I seen your beautiful light shade, and had to start my own i’m using 3.5 inch squares and a shade of Height (cm): 49,Width (cm): 48,Height (inch): 19.29,Width (inch): 7.6, just my second day, and fairly getting through them. I have been thinking about doing this,and how i could cut the time down,i bought the paper for folding already cut to this size, when i make the first cross i fold 6 at a time. Do you have any time saving tips? Other than folding a few pieces together at once (as long as you can still get clean folds) I really don’t have any time saving tips, I found this light takes a really long time to make. I probably spent at least 10 hours all together to make it, maybe a tiny bit less. Hello Allison (Sorry about the spelling yesterday) I’ve just finished making my light shade,wanted to share with you. I used over 400 fortune tellers, 1 and a half glue sticks and 2 bottles of wine! LOL……..This has been the first time I’ve ever attempted anything like this,or even used a glue gun,will not be my last. Is there a place I could post my pic so you can see it? Hi, sorry for forgetting to reply to you. In terms of posting a pic, do you have a twitter account or blog you could post it to? If not, you can always email it to the3Rsblog@gmail.com, I’d love to see it! so beautiful!! and an uncanny coincidence..
back in august 2010 i entered an art piece, the theme was ‘childhood’ and here is what i made! Beautiful! I’m making fortune tellers as I write this! You said you didn’t cover the bottom part of the lantern? Is it only a small gap since I can’t see any gap at the bottom in the photos. Thanks so much for sharing! Yes, the opening at the bottom of the original shade is only a few inches across, so you don’t really notice it once the light is finished. It can actually be fun to have a bit of pure light coming out of the bottom! Fabulous lamps! Nice work! Thanks for doing this blog. I absolutely love it! What about a smaller sphere that could fit on a night light ! Ooh, that could be really cute! One small problem I could see was the size of the fortune tellers, the smaller they are the harder they are to fold (maybe I just have big fingers?) But it could certainly work! I can also see doing half a drum shade on a night light too. Could be super cute! Are you referring to the link for the fortune teller instructions? It’s probably just as easy for you to google for those, just search “instructions fortune teller” and lots of options should come right up… You can also add “origami” to the search parameters if you need to. 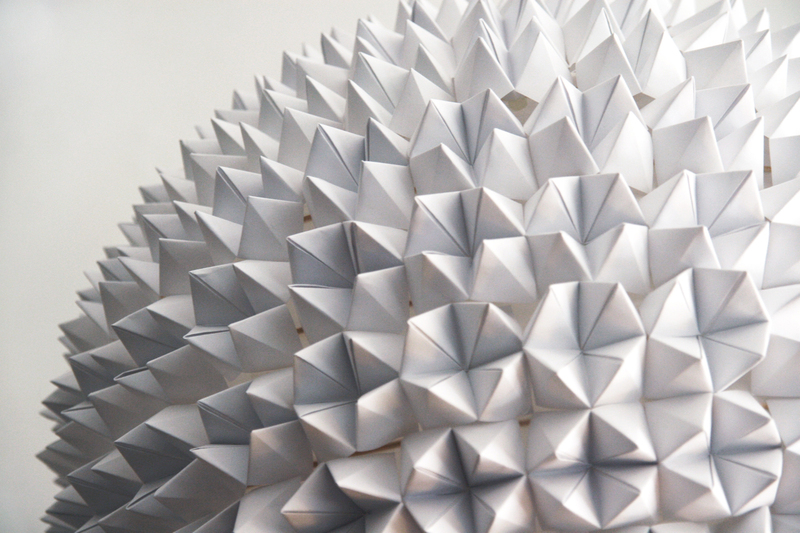 Pingback: Paper-Designs.pl » Odnawiamy nasze stare papierowe lampy. Pingback: Ohhh… Mhhh… » DO IT YOURSELF: Eine Lampe aus Himmel- und Hölle-Spielen. Himmel? Hölle? Liebe Generation Golf, was sagen wir dazu? The link for how you arrange them doesnt work, and I’ve been a little frustrated as to how you did it!! Sorry, which link doesn’t work? I was wondering if you purchased a paper lantern already wired for a light or did you have to purchase light kit to put into the lantern? This is the coolest thing I have seen on pinterest and would like to try it. I always purchase paper lanterns just on their own, usually from Chinatown, or online, and then hang them off simple light bulb cords, like the Hemma cord from Ikea. But, if you wanted to purchase a lantern already wired, that would probably work too. – here is my result .. it took 2-3 days to make. ps. we call them ”nip nappere” in denmark, haha. I love this light! I am just starting one of my own! One question for you though: at the top and bottom of the light I am not sure how to glue them on, bc of how rounded it is. If I follow the edge of the shade, the fortune tellers are not lined up together, but if I line them up they don’t follow the edge of the shade. does that make sense? How did you do it? In Thailand it’s look like a durian. and I love that’s lamp. I just wanted to mention that I made one of these (it turned out great) and it took me 225 fortune tellers. I used a 16 inch lantern and made four squares per 8.5 x 11 paper, so about 4.25 inches square. I love how it looks with the light inside, thanks for the instructions! I love your site. I think you’re amazingly talented. I can’t believe it took me soo long to find it. If you didn’t know already, your faceted pendant light was featured in the July/August edition of Couch lifestyle magazine in Germany. That’s how I found you. So I’m psyching myself up to make a small lamp, but I have one question: How do you clean/dust these lamps? Hey It would be great if you post the tutorial of how you made it. I’d like to make my own for my wedding reception lighting. I will credit you where I can! I started making this using coloured post it notes…I chose that because they are already perfect squares…my question is how did you arrange them so that there arent huge spaces? Yours is so perfect…mine look a little squashed at the bottom…any suggestions? Pingback: 5 lampor att göra själv | Husligheter – inredning och design som blogg. really amazing! i will try one by my own. may i ask by which artist is the painting in the back? It’s a Japanese artist print, that was handed down to me from my Grandmother. The signature says Sora, ’75, but that’s all I know. Thank you, Allison! I love this lamp, and you inspired me to make my own! I didn’t see your original lamp until after I completed mine, so I used 8.5″ squares, and had a lot of empty spaces left towards the top and bottom, but it looks beautiful! It was, however,HARD to do well! Kudos to you for sharing this! I love mine! Thank you again for this great post! I was interested in making or buying some of these for my restaurant. We are by the Ocean and usually have our doors open during lunch. We were concerned that the paper would yellow in the sun and also that they would be very difficult to clean (dust, occasional sauce might get on them). Any thoughts/suggestions? I’ll send you an email from my business email address, zipper8lighting@gmail.com, with some more information about these lights. I’m thinking of making something similar. Is this a safe lamp, I mean it’s not going to catch fire or anything? Thanks for replying! 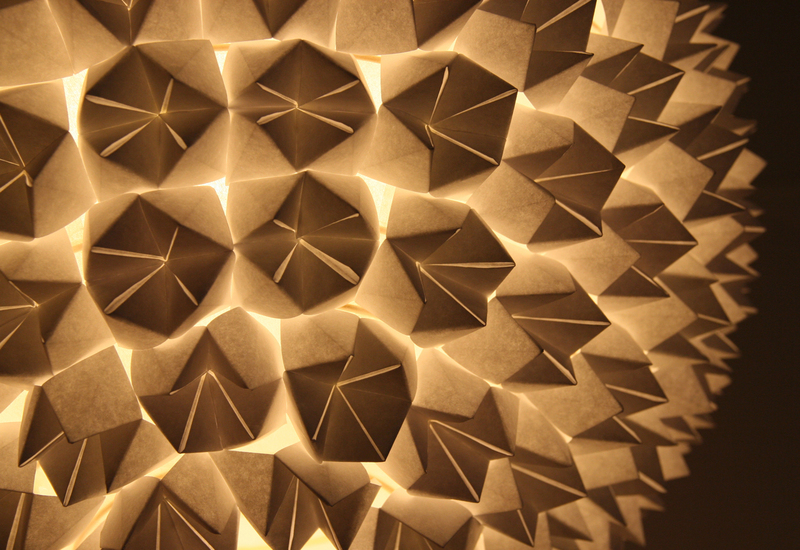 All of the paper lights that I make are formed around pre-existing commercial lamp shades. I never add any paper closer to the light bulb than the original shade, and always leave any openings uncovered to allow for proper ventilation around the light bulb. As long as you follow the bulb wattage maximums as listed for the paper lantern you use, and make sure that the light bulb is centered inside the shade and never touching the paper there should be no fire risks. Using a CFL or LED bulb will also allow you to get the same amounts of light with less heat production, and will save you money on your monthly electric bills! Has anyone tried this with a remote control color changing LED yet?